This next stop on the blog tour is at Half Agony, Half Hope, where Darcy and Elizabeth talk about music, their new friends the St. Ives, and the devil himself! There’s also a review of the book, so don’t miss it! 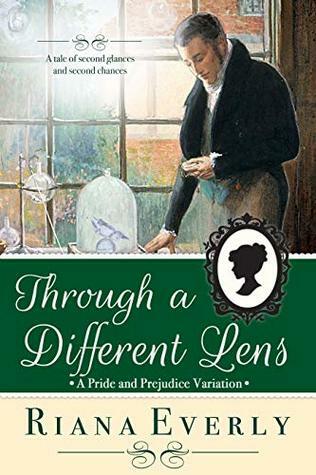 Today I am happy to welcome onto the blog Riana Everly and her new book Through a Different Lens which tells of a Darcy with a touch of Asperger’s. Book Blurb: A tale of second glances and second chances. My Review: When I first heard about this book I was intrigued and it went onto my TBR list. I was ecstatic when I was contacted by the author to be a part of the blog tour. This book hit home for me because my own brother has Asperger’s and while he shares some traits with the Darcy in this story he is a little worse than our hero. That being said I did love this story. It was unique while keeping mostly to the original storyline. I really enjoyed the new characters and I really loved whenever Richard showed up. The only thing I didn’t like about this story was the length, I would have enjoyed it being longer. This was a fast and satisfying read and I’m excited to read the author’s other books. I’m delighted to be here at Half Agony, Half Hope as part of the blog tour for the release of my new novel, Through a Different Lens. Thank you for hosting me today. In this story, I explore how things might progress if Mr. Darcy had Asperger’s Syndrome, a type of “high-functioning” autism, and if Elizabeth had some insight into his unique mind. While there are, of course, a great many challenges faced every day by people on the autism spectrum, many people with Asperger’s also have considerable strengths. Some have remarkable memories; some have keenly analytical minds or have an intuitive understanding of machinery. Some are writers or artists, and some are gifted musicians. Mr. Darcy has such a talent; he understands music where he doesn’t always understand people. In the novel, during a stressful evening entertainment at Rosings, Darcy makes the acquaintance of a local gentleman who shares his interest in music, and the two strike up a friendship. They arrange for a musical evening where they might play through some music this new friend has acquired, with Darcy on the piano and St. Ives on violin. This particular music Mr St. Ives possesses is by a relatively young Italian composer named Niccolo Paganini (1782-1840). Paganini was a gifted composer, but enjoyed most of his fame–or infamy–as a violin virtuoso. His proficiency at the violin was so profound that rumours swirled that he had sold his soul to the devil in exchange for such phenomenal talent. Paganini’s extravagant lifestyle, tall and thin appearance, and propensity to dress in black did little to dispel the stories, which he probably enjoyed for adding to his notoriety and appeal. Although Paganini wrote only a handful of pieces for violin and piano, he wrote several for violin and guitar, another instrument at which he excelled. A set of sonatas, called the “Lucca” sonatas, were written between 1805 and 1809, and Mr St. Ives’ musical associate could well have come across the music while travelling in Italy. It was also very common at the time for people to make arrangements of existing pieces for different instruments, to suit the available musicians. Many composers wrote music with alternate instruments in mind, and there are several arrangements of Beethoven’s symphonies for two pianos. I envisioned Darcy and St. Ives playing an arrangement of the “Lucca” sonatas with the piano replacing the guitar. But if you listen to one thing, make it this video. Be sure to watch the screen right about the 3-minute mark. That tells you everything you need to know about this charismatic violinist! Can you picture staid Mr. Darcy playing with someone like that? I’m not sure I can either! Here’s an excerpt from Through a Different Lens where Darcy and Lizzy steal a moment away from the crush at the party to enjoy a quiet conversation on the balcony. “Nay, do not be sorry! If you began the evening at ease, you have made great progress. And I believe I observed you enjoying some conversations. You seemed quite comfortable with Mr. St. Ives, and genuinely interested in his discussion. Do you share similar interests? Bridges, perhaps?” she joked. “You play music?” This was the first Elizabeth had heard of any musical inclination on the part of her companion. 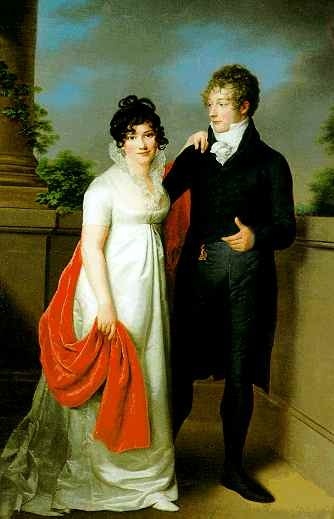 At this, Darcy grew animated, and cast off the last of the weight of the evening’s tortures. He expounded upon his thoughts concerning Mozart’s symphonies and operas, about Beethoven’s piano sonatas, and about new musical styles and compositions coming from parts of the continent. Not even Napoleon could stop the dissemination of music, and Beethoven, the great symphonist himself, had recalled the dedication of his third symphony when the tyrant proclaimed himself emperor. Elizabeth, a music lover as well, found herself enjoying the conversation and her present company very much.